Figure 2 Structural comparison of the kinase domains of ChaK (ChaK KD) and protein kinase A (PKA). The upper N-terminal lobes of ChaK and PKA are largely comprised of P-strands and are related in structure. MgATP binds in a cleft formed between the upper and lower lobes of both classical and atypical kinases and involves the conserved P-loop. The catalytic loop in the classical kinases is not conserved in the atypical kinases. The GXGXXG motif in ChaK is contained in an extended loop that may play a similar role as the activation loop in the classical protein kinases. The zinc-binding region of the atypical kinases is unique to this class of enzymes. region of PKA and contains a conserved phosphate-binding P-loop that is involved in adenosine triphosphate (ATP) binding in both atypical and classical kinases. 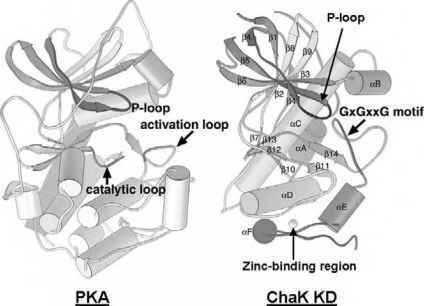 The major difference between the ChaK and PKA catalytic domains is found in the C-terminal lobes, where ChaK contains a zinc-binding module that is likely to play an important role in the structural integrity of the kinase domain. A loop that connects the zinc-binding module to the catalytic cleft is poorly resolved in nucleotide-free ChaK but assumes a more defined structure in the presence of ADP or AMP-PNP (an ATP analog). This loop, which contains a glycine motif (GXGXXG) that is highly conserved in the atypical kinases, may be equivalent to the activation loop, a region important for regulation of classical kinases. Alternatively, the flexible loop in the atypical kinases may play a more fundamental role in pep-tide substrate recognition. 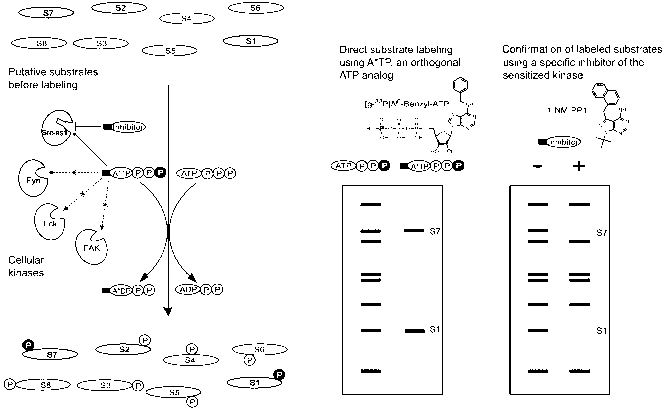 Despite the lack of amino acid sequence similarity, key residues involved in nucleotide binding and catalysis are conserved in the atypical kinase domain. 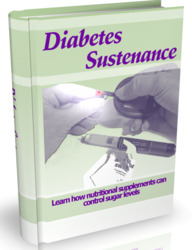 These include the strictly conserved lysine residue that interacts with the a- and P-phosphates of ATP and which is invariant in classical protein kinases. In addition, three residues (Asp-1765, Gln-1767, and Asp-1775) are situated in positions equivalent to three essential residues in the classical kinases (Asp-166, Asn-171, and Asp-184 in PKA). Thus, the general features of catalysis are closely conserved between atypical and classical protein kinases and strongly suggest that they share a common evolutionary origin. Site-directed mutagenesis studies of several of these key residues has provided direct support for their proposed roles in catalysis (Yamaguchi et al., unpublished data). However, mutation of conserved cysteine residues in the zinc-binding module would be expected to seriously affect structural integrity of the protein rather than have a specific effect on kinase activity [15,23]. Mutation of a glycine in the GXGXXG motif has also been found to inhibit ChaK activity, presumably by affecting peptide substrate binding . Notably, there are some significant differences between the atypical and classical kinases in terms of the detailed features of the nucleotide binding site. Moreover, the hydrophobic ATP-binding pocket of ChaK is not strictly conserved in other atypical kinases. The distinct features of the ATP binding region of the atypical kinases provides an explanation for the fact that small-molecule inhibitors of the classical kinases have little or no effect on EF2 kinase (Matsushita and Nairn, unpublished results), whereas a novel class of selenocarbonyl compounds are specific inhibitors of EF2 kinase but not of several members of the PKA family . It seems likely that it should be possible to exploit the specific properties of the ATP binding site to develop molecules that selectively inhibit the different atypical kinases. A notable feature of the active site of ChaK is the absence of the so-called catalytic loop (Fig. 2). This feature distinguishes the atypical kinase active site from that of the classical kinases, and highlights the similarity of the C-terminal lobe of ChaK to the family of metabolic enzymes that contain the ATP-grasp fold. The elucidation of the structure of the ChaK kinase domain, as well as other ATP-utilizing enzymes such as phosphatidylinositol phosphate kinase IIP , lends additional support to the idea that there is an evolutionary linkage among these various groups of proteins and the classical protein kinases [26,27].